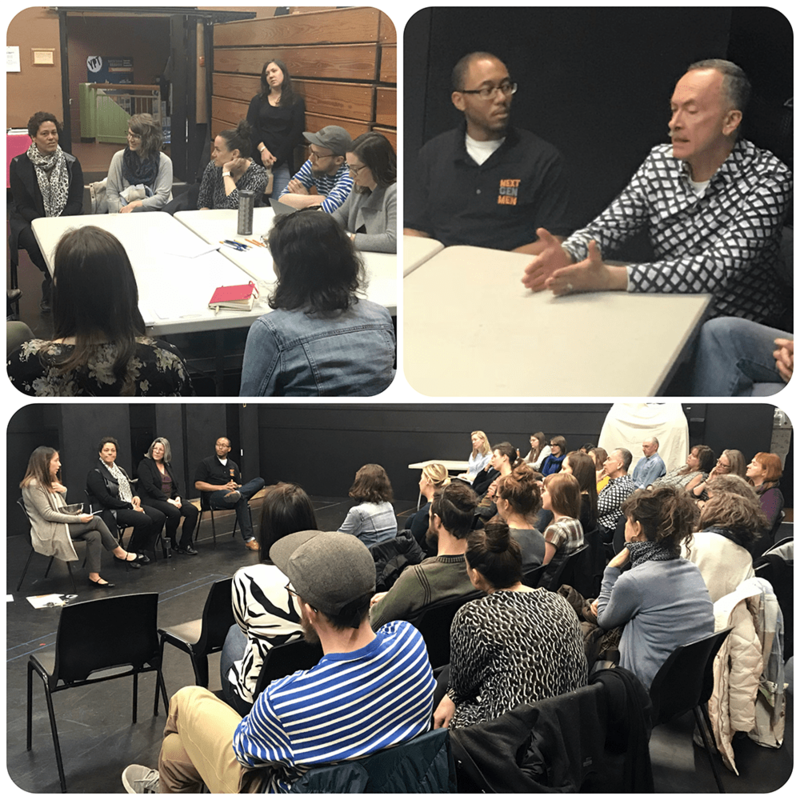 On March 26, YPT held an educational forum for parents, educators and artists in connection with Selfie, our upcoming production for teens. This award-winning play offers an honest look at sexual consent and self-promotion in the era of social media. Prior to the forum, young people engaged in YPT’s Education & Participation programs generated a list of questions they had about consent and accountability. Examples included, ‘How can adults bridge the generational gap to talk to teens about consent in a relevant way?’ and ‘How can adults make sure teens are safe while also giving them freedom to make their own choices?’. Selfie: A Forum at YPT, March 26, 2018. These questions ignited a thoughtful and timely discussion with our panel of experts, including Alyson Van Beinum (Pine Ridge Secondary School), Audrey Rastin (Boost for Kids), Jermal Alleyne (Next Gen Men) and Selfie Playwright Christine Quintana. See the students’ full list of questions below. Selfie will be presented in the YPT Studio April 23 to May 11. To learn more about the play, which is recommended for Grades 8-12, click here. Teens recognize that times have changed from when adults were teens, especially with the emergence of technology and social media. How can adults better understand the role that social media plays in connecting teens with one another, and best talk to them about using it safely? How can adults bridge the generational gap to talk to teens about consent in a relevant way? Teens feel that talking about consent with parents and partners can be awkward. How can adults make talking about consent less awkward? What can adults can do to prepare teens to have less awkward conversations with their partners? Teens want to talk about consent and relationships with adults that are open-minded, relatable, and “on their level”, not strict and judgmental. How can adults show teens that they are “on their level” when talking to them about consent? Teens feel that their parents’ bias and comfort level in talking about consent affects their own understanding of consent and what makes a healthy relationship. How can adults recognize and put aside their own biases to allow teens to form their own opinions? Teens want to learn about consent in a myriad of ways, especially because some people are more comfortable talking about it than others. How can adults teach teens about consent that isn’t just the one time they have “the talk”? Some students say that adults tend to put a lot of restrictions on them (parties, dating, etc.) because they think teens can’t be responsible. How can adults make sure teens are safe while also giving them freedom to make their own choices? Should I go to a party if I know there will be alcohol involved? What is the best way for adults to talk to teens about the effects of alcohol on their ability to understand when they have consent? Some teens express not knowing where their comfort level and boundaries are in being sexually active. What are the limits? When is the time to say no? And should I talk to someone about [how far I should go] or just handle it myself? How can/should adults help teens understand their own boundaries?